Of all the sites in Crete that beckoned, it was the thousand-year-old Sacred Myrtle Tree that I most looked forward to visiting. I had first read about it in 1995, in Carol Christ’s Odyssey to the Goddess. * Carol described the Panagia Myrtià, the All Holy Myrtle, as a place of veneration, tended by the local nun’s, and extremely sacred. At that time, I was about to begin my own odyssey over the months and years to come, first encountering the Black Madonna while doing genealogy research in Italy, and then returning to Italy to delve deeply into my ancestral heritage. Now, here I was in 2015, twenty years later, gathered at the base of the Sacred Tree with Carol Christ and a group of women as part of a Goddess Pilgrimage. Tears came to my eyes as Carol read the story of her first visit to the Tree, the very story that had called to me long ago. We do not know who our stories reach when they go out into the world. The Tree stands at the back of an enclosed convent, a place of deep peacefulness, which one enters through an arch. 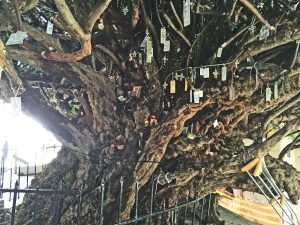 The branches of the Sacred Myrtle are covered with ex-votos, offerings in metal tied to the Tree in hopes of a blessing or in recognition of a healing. Below the massive trunk is an icon of a Madonna and Child, and to the right is a little alcove where one can light a candle. The large branches easily carry the hopes and prayers that are tied onto it. Like the Black Madonna, it seems to have an endless capacity to comfort, to receive requests, to listen. At the center of the Tree, now completely enclosed, is an icon of a Black Madonna, according to Ean Begg in The Cult of the Black Virgin. The Tree and Madonna have become one. After Carol’s recitation of the story, we women each tied a colored ribbon onto a branch and stated what it meant to us. Mine was lavender-colored, evoking the joyful presence of a three-year-old girl with bundles of lavender who appeared in my Dream earlier that year. Those who visit the Tree are permitted to take a twig from a dry branch with them. Even when I’m not holding this twig, I feel a deep connection with this Tree and my experience there. In the small gift shop of the monastery, I purchased a small bottle of myrtle oil from a nun completely clad in black. When I returned home, I anointed my own Black Madonna statue with the oil: her forehead, her blessing hand, her lap. Now when I touch my forehead to hers in my morning blessing, the fragrance of myrtle is still perceptible, a sensual communion with past and present, wood and the divine, Tree and Mother, yearning and manifestation. *Carol Christ’s Odyssey to the Goddess has been republished as A Serpentine Path. This entry was posted in Black Madonna, Mother, Ritual, Virgin Mary, Women's Spirituality by Mary Beth Moser. Bookmark the permalink. This beautiful writing brings the rich experience floating back to me. Thank you for recreating what we were so lucky to experience with each other and the wise woman elder Carol Christ. I still carry my little twig in my purse. . .
Mary Beth, you have ignited a yearning in my heart to visit this sacred myrtle. I love what you write at the end, “…a sensual communion with past and present, wood and the divine, Tree and Mother, yearning and manifestation.” I am sitting with the Black Madonna here in my heart. Thank you. I appreciate hearing these words from you, Lori, thank you for sharing. I have also visited Millennial Trees in Sardegna and, the feeling was similar, of being in the presence of Wisdom and Compassion.